Wedding season is here, which means it’s time to pull all the stops. Everyone is familiar with classic dress codes, from semi-formal to black tie, but have you been faced the newest wave yet? Barnyard chic. Beach formal. Sunday best. If this is your first time seeing these, have no fear, we’ve got you covered. Below, we dress you head-to-toe for the four most mystifying dress codes on your wedding RSVPs this season. Spread across acres of green fields, this theme brings to mind gingham, goats and haybales. This dress code is sure to guarantee an Instagram-worthy experience, from the larger-than-life barn doors to the coordinating—but not matching—place settings. Stand out from the bucolic landscape with a high-contrast lace dress and pale blue accents. A midi length dress and a block heel are safe options for a potentially-muddy dance floor. Beach life is simple—read linen shirt on the groom and flower crown with flowing hair on the bride. 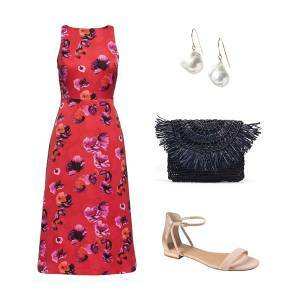 Even if the invite says formal, this look should be anything but stuffy. A floral maxi dress brings an elevated Hawaiian-shirt vibe and natural pearl earrings compliment the environment. Flat sandals won’t sink in the sand, but a metallic touch gives this casual staple a dressed-up feel. This isn’t your traditional black tie event—keep it formal, but have fun with it. Black is obviously a safe choice, but now you can use this opportunity to wear the pants, or take it a step further with a jumpsuit—this one has pockets! Since you’re going around the rules, make sure to accessorize to the nines: brocade sandals feel the right kind of “extra” and a raffia clutch is a must for warm weather. Garden party is code for florals. Stand out from lush botanicals and colorful crowd with a neutral palette and off-the-shoulder sleeves. Pale pink accents add just a hint of color (so you still fit in with the theme), and block heels won’t sink in the mud if the party is actually in a garden. Wherever your calendar takes you this spring—wedding, shower or a last minute event—we have just the outfit for every dress code. Find your perfect look in the RVSP Everywhere Shop.